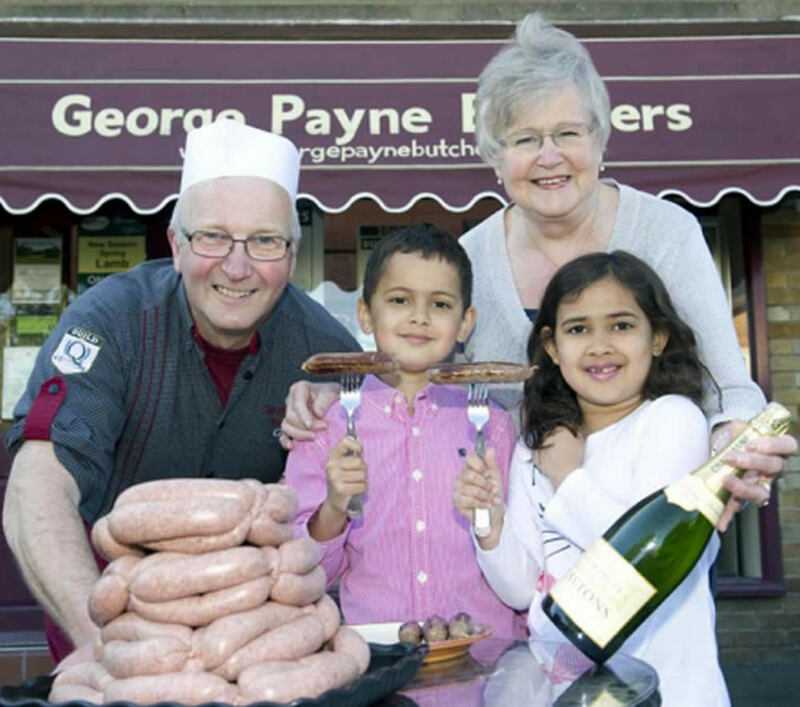 NewsHome » Three gold award wins at the Smithfield Awards for George Payne Butchers. Three gold award wins at the Smithfield Awards for George Payne Butchers. Daniel Bansal, accompanied by his sister and grandma, is pictured with butcher George Payne outside the Brunton Park shop with his Diamond Jubilee sausage that scooped a gold award in the national product evaluation event. 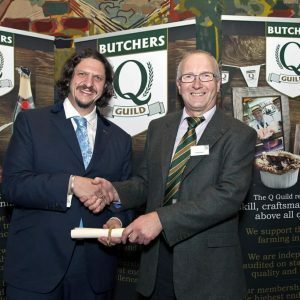 Butcher George Payne, right, is pictured at the Smithfield Awards with Jay Rayner. The awards windfall was achieved at the annual Smithfield Awards, organised by the Butchers Q Guild, the UK’s top independent butchers’ organisation, and held at The Butchers Hall in London. One of the gold awards fell to a lamb, mint and redcurrant jelly sausage created by Daniel Bansal, from Gosforth. The youngster’s banger was chosen as the winner of a competition run by the Princes Road shop earlier this year, when customers were challenged to create a signature sausage fit for the sovereign, as part of the Queen’s Diamond Jubilee celebrations and Payne’s own 25th anniversary in business. The two other George Payne Butchers’ gold award-winning products were lamb burger with mint and redcurrant, and smoked back bacon. For good measure, the shop also received a silver award for its oak-smoked streaky bacon. Awards were presented by broadcaster and food critic Jay Rayner. 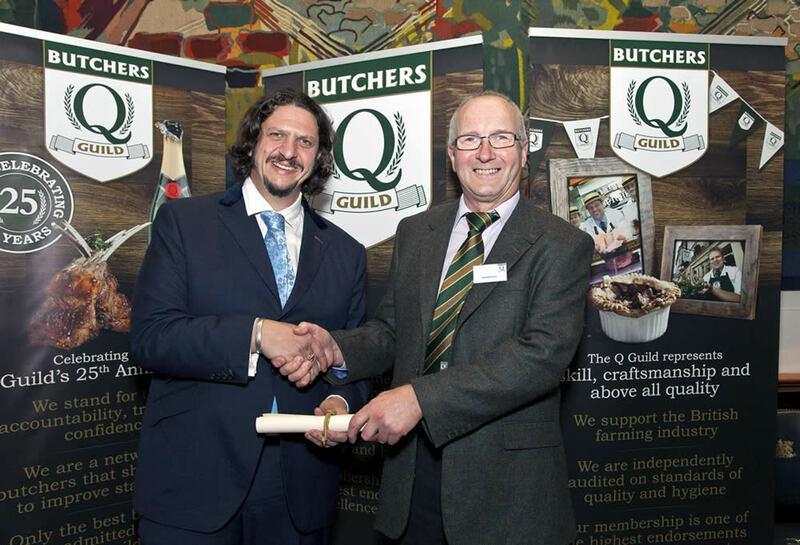 Established in 1986, the Q Guild promotes traditional craft skills and award winning meat products. Its UK members serve £3 million worth of meat and related products to over a quarter of a million consumers every week. 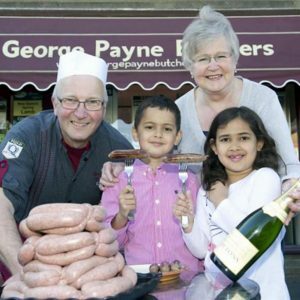 George Payne has been a traditional family butcher for over 40 years and established his own business in Brunton Park in June, 1987. The shop sources locally fed and reared meat products – notably rare breeds beef, lamb and pork – through long-established field-to-plate partnerships with Northumberland farmers. George is one of celebrity chef Rick Stein’s “Food Heroes.” The shop has won numerous local, regional, national and international awards over the years in meat trade competitions.